A team of Russian sedimentologists, directed by Alexander Lalomov (Russian Academy of Sciences, Institute of Ore Deposits) applied paleohydraulic analyses to geological formations in Russia. One example was the publication of a first report in 2007 by the “Lithology and Mineral Resources”, journal of the Russian Academy of Sciences. It concerned the Crimean Peninsular. It showed that the time of sedimentation of the sequence studied corresponded to a virtually instantaneous episode, whereas according to stratigraphy it took several millions of years. Moreover, a second report concerning the North-West Russian plateau in the St. Petersburg region shows that the time of sedimentation was much shorter than that attributed to it by the stratigraphic time-scale: 0.05% of the time. The third report concerning the the Ural determines equally the time of sedimentation. I concluded an agreement with the Institute of Kazan for the Moskovite team of sedimentologists to determine the paleohydraulic conditions of the local transgressive sequence studied in 1868 by Golovkinskii, founder of sequence stratigraphy. This forth report determines equally the time of sedimentation. We presented their report to the 33rd International Congress of Geology held in Oslo in August 2008, and in Ekaterinburg (Russia), in October at the 5th Conference on Lithology. 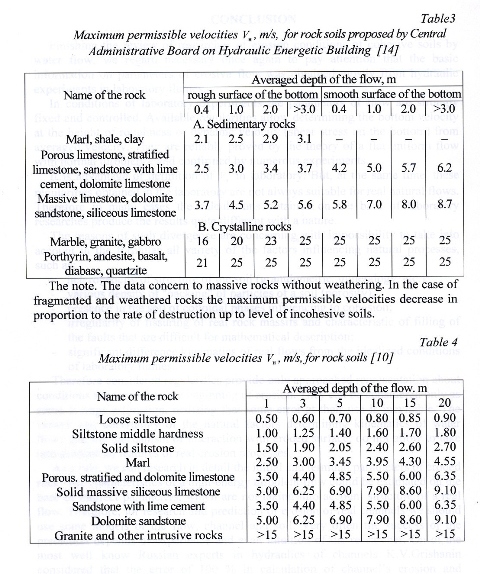 A new series of experiments was arranged with the St. Petersburg Institute of Hydrology to study erosion of different types of rocks (sandstone, limestone) at higher velocities of water current up to 27m\s to ascertain their rate of erosion over time and to provide the formation of conglomerates, to know the critical velocity of erosion of conglomerates seen in sandstone at the base of transgressive sequences. Initially, the water current was parallel to the surface plane of the sedimentary sample. The results show that at a velocity of around 25m\s, erosion was nil; where the period of the experiment was less than an hour. However, when the period reached 18h the erosion was around 2 grams. Experiment 25 was done with a sample whose surface was at an angle of 2.5 degrees to the direction of the current. In this case erosion reached 6.6g. in 18h.